In the first build of the Integrated Hypersonic Aeromechanics Tool (IHAT), the fundamental disciplines of Propulsion, Aerodynamics, Structures, and Thermal Analysis were integrated into a seamless process that simulated the overall performance of a high speed missile. The design structure matrix for Build 4 of the IHAT system shows the connections between the different analysis modules, including Geometry, Aero, Propulsion, Trajectory, Thermal, Structural, Stability & Control, Sensors, Lethality, and Cost. A hierarchical optimization strategy was implemented in IHAT, where structural thicknesses and ply angles were optimized in the Structures Module, and insulation thicknesses were optimized in the Thermal Module. 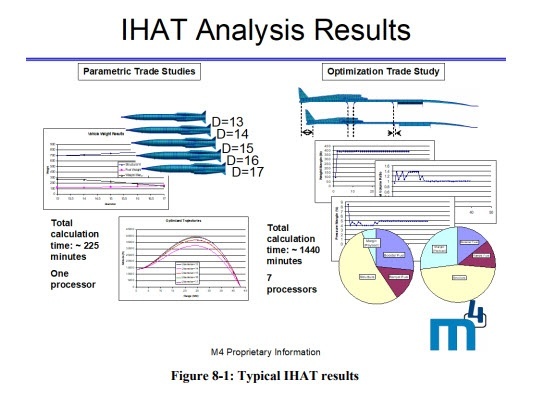 The IHAT system provided an ideal foundation for developing the proposed analysis system. The fact that the IHAT system already existed significantly reduced the risk of the proposed effort.